LinkPush– The wait for 2.2 is a long and difficult road, but we’ve found a way to emulate the push-to-Android functionality in 2.1! We’ve written about this app before, but it couldn’t hurt to give everyone a quick link. Push URLs from Chrome to your phone using this app and the associated Chrome extension! On My Way – I love this concept. 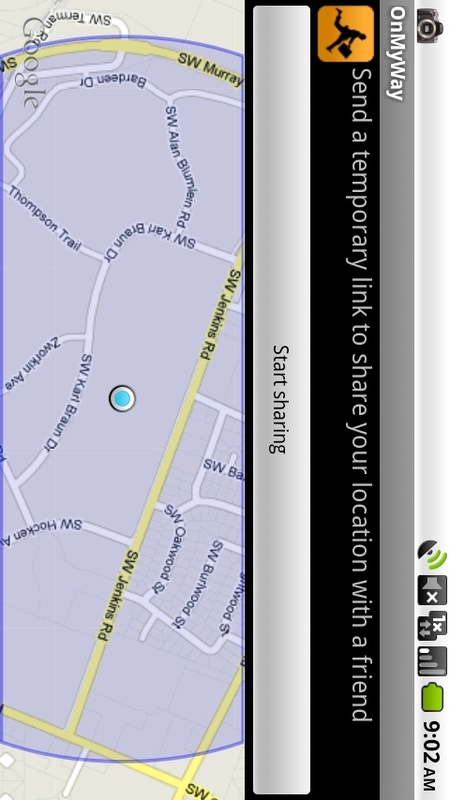 OMW generates a URL to send to your friends, which in turn lets them view in real time where you are using GPS. Perfect for those not quite trusting of their potentially unfaithful lovers, and those who hate that awkward waiting time between when friends say they’re getting in the car and when they actually show up. TiKL – Weird acronym aside, TiKL looks to turn your phone into a Push To Talk Walkie Talkie; apparently, all you need is your friends’ user number to make it work, and it claims to not incur voice or text fees. I’m skeptical to how it works, but it might be worth a look. XBMC Remote – For all you people with Xbox Media Centre installed on your modded console or PC, XMBC Remote gives your phone the ability to manipulate the program. This is great for those people who want a cheap remote, or one that won’t get lost between the couch cushions. Works on wifi, so you’ll be able to channel change from across the house, as long as you’re on the same network as your XMBC box. Shapewriter – For those who didn’t get into the Swype beta, Shapewriter is a similar system that uses dragging gestures on a keyboard to type out words. I’ve tried Shapewriter before, and I can say I wasn’t impressed; it just doesn’t seem to work as well as Swype; the controls are less intuitive, and the dictionary doesn’t seem to be as refined. There also isn’t a robust tutorial like Swype, which contributed to some confusion as I tried to make the switch, and thought some controls would carry over. Give it a try if you haven’t tried Swype. Tedd’s Droid Tools – Interestingly enough, the app’s name is a bit misleading: it only has one “tool” at the moment, which is the ability to answer phone calls without pressing an on-screen button. This, as the app description says, is useful for phones (like our Droids) which don’t have dedicated “answer call” buttons. I’ll be definitely will be giving this one a try, but I don’t get calls all that often.